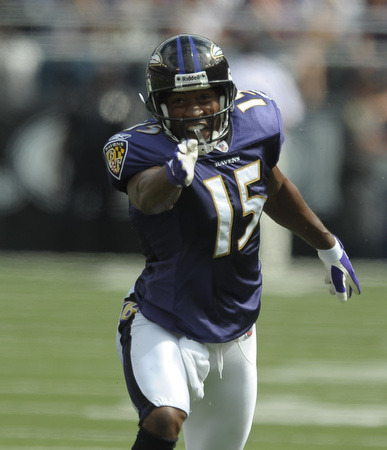 On May 14, 2009 the Ravens held an off-season mini camp to address the need to add a wide reciever. I’ll admit that when seven year vet Kelley Washington beat out such forgetables as Tab Perry and Jerry Porter and signed a year deal, I was at the very least underwhelmed. It was no Anquan Boldin or Brandon Marshall to be sure. Washington would probably help out on Special Teams but I, like most fans probably didn’t think he’d really help the offense all that much. But football is about making the most of opportunities and so far Washington has announced his presence in Baltimore with energy, emotion and most of all production. So far, Washington is tied for the team lead in receptions with 12 and he’s provided a solid target only dropping one pass thrown his way. He has manned the slot position well and has given Joe Flacco yet another viable target in the burgeoning offense. He’s also made everyone, including the coaching staff forget the name Demetrius Williams who has been relegated to an afterthought on game day. But something else he’s done is help give this new offense some flash and attitude. Forget the Flash Mob, the Squirrel Dance is the new move of choice around town. Fans can’t seem to wait to join in on one of his wild celebrations as he points towards the end zone after a First Down. And why not? For years the defense has had a monoply on the celebration with Ray’s dance moves. It’s about time the offense was the center of the party.